The Manchester United captain is far from happy that his record-equalling goal has been overshadowed by the post-match incident. Manchester United captain Wayne Rooney. WAYNE ROONEY HAS taken a swipe at media coverage of his shirt swap with Reading’s George Evans following Manchester United’s FA Cup win over Reading. The 31-year-old scored the opener in the 4-0 victory at Old Trafford to move level with record-holder Bobby Charlton on 249 goals for the club. After the final whistle, Rooney offered to swap jerseys with Evans — a former Manchester City youngster — who appeared to turn down the request as he walked over to applaud the visiting fans. Evans later tweeted to clarify that the pair had exchanged shirts in the tunnel and congratulated Rooney on his record-equalling strike. Rooney has now hit out at the extensive coverage given to the incident within the UK media, accusing some outlets of prioritising the incident over his latest goalscoring landmark. Alongside a photo of him and Evans, he wrote on Twitter: “I find it amazing that I equal sir Bobby Charltons record and this is a headline in the mail [sic]“. 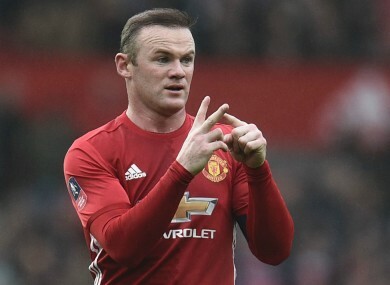 Speaking after the match, Rooney stressed his determination to reach 250 goals over the next two home matches in the coming week against Hull City and Liverpool. “It’s a proud moment to do so at such a massive club like Manchester United,” he told BT Sport. “I’m hugely honoured to be able to play for this football club but to be up there in terms of goals with Sir Bobby is a really proud moment for me. Email “Rooney hits out at Evans shirt 'snub' coverage”. Feedback on “Rooney hits out at Evans shirt 'snub' coverage”.